​A large percentage of our new business comes from referrals. Check some of them out below. We are very proud of them...! I didn’t have a pet fence installed; my daughter and son-in-law had me sit at their house while they were at work and had one installed. That’s what happens when you are retired; your kids’ think that you need to be kept busy. With a background in engineering and construction I get all these type of “hey dad can you be at our house today while "xyz" happens” type of requests. I usually get to have input on what type of product to get and who will be doing the work. But sometimes they can’t wait while I do all the research. So, this particular request was: we are having it done tomorrow and all you have to do is give access to the house. I knew the general principles about electric pet fences and had watched during the summer while my neighbor had one put in. It took the Large Franchise about 2 hours to install. They left a pretty bad scar on my neighbor’s lawn with their quick and dirty install. My neighbor told me that they paid over $2000 for the fence. I was concerned about my daughter spending that much since she had a larger perimeter than did my neighbor. When my daughter told me that their fence was going to cost them a lot less; well, I didn’t know what to say…. could they have actually found someone to do the same quality job for that much less? The answer is YES and then some. Pittsburgh Pet Fence did a most thorough job at my daughter’s house. They took 6 hours to install the system, test it and give me a training session with the dog. They spent extra time digging the trench by hand, and cinching the ground to make it look nice which allows less scaring of the lawn instead of using a powered trenching machine. They added protective conduit around the pet fence wire in areas where the homeowner is likely to do edging work. They crossed the concrete driveway by removing the old cracked (ugly) bituminous expansion material and after placing the cable in the groove; they re-caulked the joint using a quality exterior caulking material and did so in a most meticulous manner to insure an attractive final product. 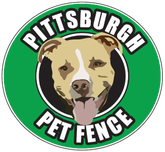 Ed, the owner of Pittsburgh Pet Fence, did the work and all I can say is that I have found someone who is as meticulous about things as I am. So, how can someone spend more time, do a quality installation and offer such value? They own the company and do the work themselves; they do not have to pay a franchise fee; they care and they are craftsmen; they don’t try to do 2 or 3 jobs a day and most of all you can tell that they enjoy doing what they do. Best Investment I've Made for my Dogs! We have to admit that we were a little dubious about the cost/benefit of installing an electric fence and unsure of how it would effect my husbands meticulous landscaping, etc. Ed was wonderful to deal with and his installation was very precise. He patiently hand cut the ground through our landscaping so that you honestly couldn't tell where he had been. He was friendly and clearly had both the needs of our dogs and families as well as consideration for our neighbors. We can't say enough about how much we appreciate Ed's knowledge and commitment to make sure that we were satisfied. His prices are far lower than the competition and he stands behind his work. Over all, we would have to say that this fence system has been well worth the investment. The Cost of his Installation was less than HALF of the Cost! I would call him again in the blink of the eye!!! This Fence Truly is a Lifesaver! 5 Stars from Our Family! Absolutely, Amazing Difference in my Life!